In the combined average of national polls, Real Clear Politics shows a 5-point lead for Obama. 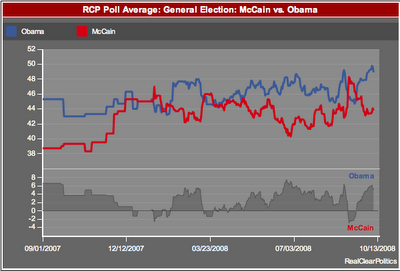 In particular, today's Gallup national poll shows Obama with his biggest lead ever over McCain - 11 points. It is still too early to declare the McCain campaign to be in a tailspin, but they have lost momentum just as they have unleashed their most fierce attacks. September was the month the McCain campaign was supposed to win the post-convention bump and keep it. They got the bump, but then lost it in the frenzy of our current economic crisis, and the way both candidates were perceived in recent weeks. Obama has been perceived at remaining calm, clear, and friendly. McCain has increasingly been perceived as irritated, erratic, and sometimes angry. In previous election cycles, an angry candidate was sometimes seen as a sign of strength and would win a lot of white male votes. Geroge H.W. Bush was pretty swift in his dismissal of Michael Dukakis in 1988. His son was often snappy and angry at John Kerry in 2004 ("Tell Tony Blair we're going alone!"). But I am tempted to say that a good number of voters are better informed and watching a little closer this election cycle. It could be the result of our faster news cycle (which seems to look only 24 hours back and 24 hours forward). It could be the effect of YouTube and other Web 2.0 mediums. Or it could be that those who voted against Bush in 2004 are working harder to both promote their candidate and stay informed about the other side. The Left is hungry for a victory. We haven't won a presidential election since 1996 (or 2000, if you want to get technical, as Gore won Florida). Meanwhile, some of our best bloggers are reporting movements both home and abroad. Apostropher: Swift boater Jerome Corsi is seeking a Kenyan -any Kenyan- to appear in a 527 ad claiming Obama is a closeted Muslim terrorist sympathizer. But his evil plan has hit a little snag.